Price for the above picture (painted in two coats of semi-black (metal) paint is: £340. Size: Depth 3ft (91cm), length 5ft (1.52m), height 7ft 6" (2.28m) approx. 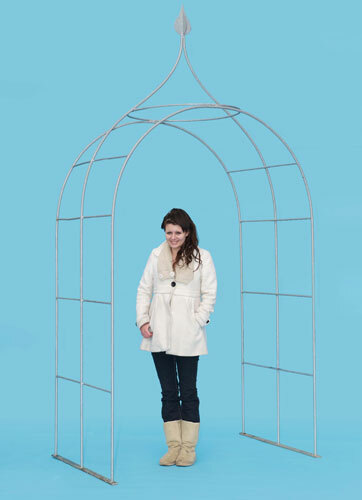 Please note this arch comes with a choice of 18" pins or extended feet (approx 18" extra to add to the above measurements), which are to secure the item in situ. If unsure please contact us. For Different sizes / finishes etc please see our specifications page.